This ammunition, packaged in 50 twenty-round bulk packed boxes, is perfect for an SKS or AK-pattern rifle. 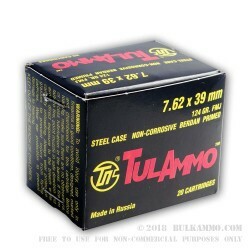 Made in Russia by the Tula Cartridge works, these cartridges fire a 124 grain bimetal jacketed bullet at a velocity of 2330 feet per second out the muzzle. 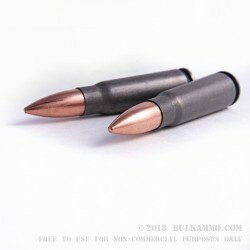 Unlike some surplus ammo, these cartridges use non-corrosive Berdan primers and steel cases coated in non-toxic polymer, which promotes reliable feeding and ejection. This ammo may not be suited for all ranges due to its magnetic properties. Tula Cartridge Works, located south of Moscow in the Russian Federation, produces billions of rounds of ammunition every year. In addition to seeing domestic use, this production is exported to over 20 countries worldwide including the United States. Tula ammo has gained immense popularity in the US, with over 500 million cartridges imported every year. The plant has operated in various forms since 1880, when it opened under the auspices of Russian Emperor Alexander II. great price and delivered to my front door. Good Ammo - Good Price - Great Customer Service !! I have been dealing with bulk ammo for about a year now and have not had any problems. Great service and great shipping time and always quality ammo. As far as this Tula ran 300 rds through my ak w/o any problems. Its an AK! burned thru a few hundred rounds without a hick-up! A: Hello Steve, No, these 124gr. FMJ rounds by Tula in 7.62x39 are non-corrosive. You can safely shoot them without having to worry about corrosive primers. Q: 1) Is this steel core ammo? 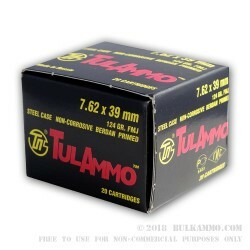 2) What differentiates this from the cheaper Tula ammo? 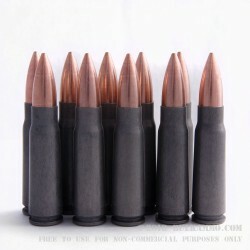 A: 1) While this ammo does not contain the traditional steel core other calibers may have (5.56x45), the bullet jacket does contain a steel bimetal composition. This means it will stick to a magnet which may not be acceptable for indoor ranges. 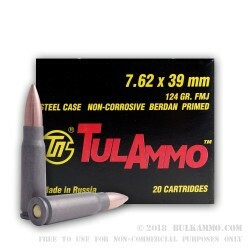 2) The difference in price for Tula ammo will depend on the bullet used. 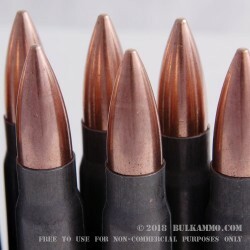 Tula manufactures this ammo in Full Metal Jacket, Hollow Point, and Soft Point. Soft point usually costs a little more due to the increased cost of the bullet.